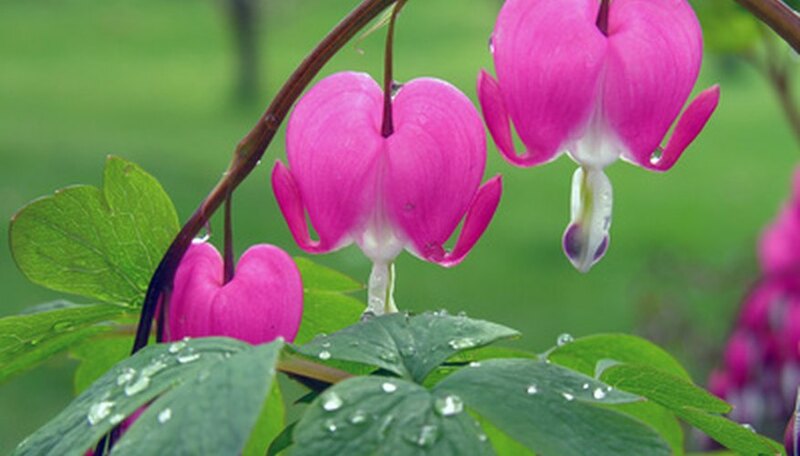 The bleeding heart (Dicentra spectabilis) enjoys cool, moist soil with partial to full shade. The plant does not grow well in flooded wintertime areas. It also cannot tolerate bouts of hot, summertime drought. The plant produces unique heart-shaped flowers in shades of pink and white, yellow or pure white. Highly deer resistant, the bleeding heart does well in a woodland garden setting. An excellent cut flower, the blooms often last up to two weeks when placed in water. In March, the foliage of the plant begins to appear in a mounding, fern-like habit that measures between 6 inches to 2 feet in height depending on the perennial's age and also its variety. The foliage appears heavily lobed in a shade of powdery-green. Once foliage appears, delicate flower stem arches grow. Flowering takes place from May to June. The flowers of the bleeding heart grow in racemes along the arching stem. They appear single file. Most are shades of pink or red with a simple drop of white. Pure white and pure yellow flower varieties are also available. During the height of summer the bleeding heart begins to go into a state of dormancy. The foliage will begin to yellow and die back. When August arrives the plant has usually died completely back to the ground level with no remaining foliage. The fragile, small rhizomes of the bleeding heart begin to store nutrients for the long winter months. When the fall months arrive and the soil temperature drops from the cool nights, the rhizomes develop crown buds within the soil's depth. The crown buds will form the foliage and flower stems the following summer. The small buds pop out on the rhizome as small bumps. The root system of the bleeding heart requires a cold winter dormancy to ensure the following year's plant growth. During winter the plant enters a complete state of dormancy and all growth stops. The rhizomes await the warming conditions of spring before breaking dormancy and growing again. Most bleeding heart plants will grow well for three to four years before the rhizome-based root system requires dividing so the plant does not become leggy.